Time to say good-bye to Kephalai. 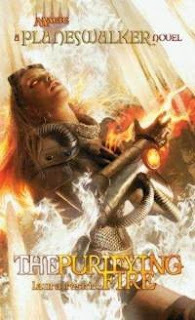 Chandra runs all the way back to her cell, kicks out the cowering guards that are still alive, and welds the door shut. The pounding on the door begins almost immediately, so as soon as Chandra gets herself into the proper meditative state, she jumps into the Blind Eternities. 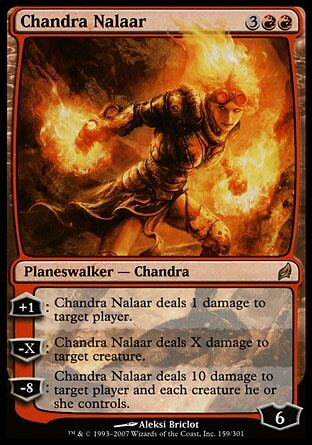 Chandra fell through a tunnel of flame. And, having had no time to prepare herself for planeswalking, she was unprotected from the raw, red, furious force of this fire. It scalded her so brutally that she cried out in agony, feeling it burn through her flesh, her blood, her bones, and sink into her soul with angry, destructive heat. 'Walking the planes isn't an easy thing, and not since the first time she accidentally planeswalked has she ever entered without all the proper protections. Nearly depleted of mana and without protection, Chandra has a hard time holding on to her identity. She can't stay here for long. She needs to return to her physical self, regain her composure, and then find her way home. The first place she touches has a sense of darkness about it, but she can't be sure the next plane she finds will be any better, or if she'll find another plane at all, so she goes on in. It's night, and the trees are strangely bare for a place that doesn't feel like winter. The temperature is mild and not cold, and the air is even humid. The weather is strange enough that she examines the tress a bit closer. The branches feel squishy as if they're rotting from the inside. The bushes aren't in any better shape. But how much of a concern is all this really? All Chandra needs to know is that she failed in her mission and is likely never going to recover the scroll ever again. All she can hope for it to recuperate and then head back to Regatha, hope the ouphes have calmed down, and be ready for whenever Walbert makes his move again Keral Keep. Just watch him try! Some sounds in the nearby bushes catches her attention and she goes to investigate. She's grossed out at the goblin eating a mole alive. When it notices her, it pops the mole into his mouth and bites down with a loud crunch. They stare at each other for a moment. "Well," she said at last. "That may not be the single most disgusting thing I've ever seen, but it's definitely on the list." "List?" The goblin's voice was deep and husky. "Agreed. You don't kill me, and I won't kill you." The goblin is quite responsive to her questions. He tells her that the place is called Diraden and his name is Jurl. When she tells him she just wants some water and then she'll leave and he'll never see her again, he isn't opposed to the idea. But he warns her that going to get water isn't safe. People get taken when they go get water, thanks to Prince Velrav. In fact they get taken by the water, the ruins, the woods, the hill, the village, the castle, etc. Chandra decides that if everywhere is dangerous, she might as well go get some water. She tells him she's a powerful fire mage and as long as he cooperates things will go good for him and soon she'll be gone forever. By morning at the latest. Jurl has to correct her one last time, and says that morning never comes. Not here. From their discussion on the way to the water, Chandra comes to the conclusion that Prince Velrav is some kind of necromancer that brought about this eternal night for some reason that was supposedly a good idea. Well, the water is quite good and both of them drink their fill, however Jurl becomes alarmed when he spots a bog wraith . He points it out to her, says that it will report their presence to others, and asks her to kill it. While tempting, Chandra decides that maybe she should try to learn from her experience with the ouphes. She decides that since she's going to be leaving soon anyway, she might as well make her presence as inconspicuous as possible, and she tells him they should just back away. Chandra tells the goblin that she'll be leaving soon, but can't explain to him where she's going. He tells her that he's hungry and asks her to wait and that he'll be back with food. Getting home is what matters to her so she heads back to the ruins where she appeared, to prepare herself for the trip. When she sees a strange white flash in the ruins, she decides maybe its best she just planeswalk from where she is right now. She stretched out her senses in order to call on the mana of the Keralian Mountains as a means to protect herself. A flash of panic washed through her when she realized she could scarcely feel it. That shouldn't be. She's feeling stronger and more clear headed now. 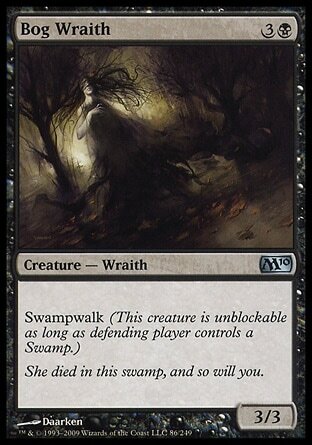 She should be able to establish her mana bonds. The familiar surroundings of the ruins might be necessary to help her get back home, so she takes a closer look to whatever is going on in there. She takes a look and there's a man kneeling in the mud. 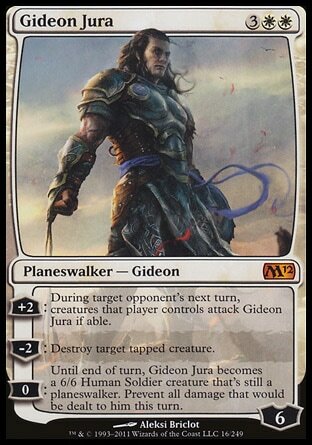 Gideon . There was a lot of description about the plane of Diraden. A lot of description on the weather and the state of the trees that Chandra was noticing. Maybe that's something that would catch her eye because of being in such an unfamiliar place, but it wasn't something I was particularly captivated with. But as soon as Chandra came in contact with Jurl, things were moving along quite nicely. It's strange, but interesting at how friendly he was, and nice to see her not just go fire crazy. Although by the end of the chapter we realize while it may have a tiny bit to do with character growth, it was possibly more to set up the surprise ending that she can't cast anything even if she wanted to. As for Gideon... did he follow her here? Or... were the both lured and trapped? 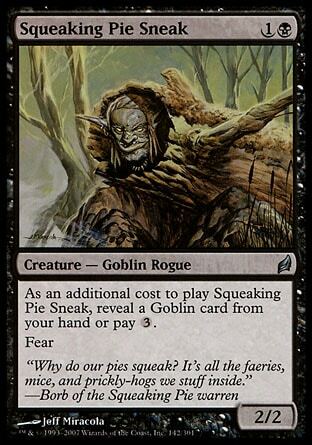 Some kind of planeswalker bait led them here. We'll find out soon enough. There you go: eternal night. It got dark.